The small hamlet of Chrissiesmeer is the centre of South Africa's largest lake district with some 270 lakes and pans located with­in a 20 km radius of the village. The largest, Lake Chrissie, was named after President M. W. Pretorius's talented daughter Christina. Chrissiesmeer is the largest natural body of fresh water in South Africa and measures about nine kilometres long and three kilometres wide and has a circumference of 25 kilometres. It is about 1500 ha big. These pans do not have inlet or outlets, it is only rainwater that fills it. All of these pans have a sandstone rocky side on their north western shore and only sand on their south eastern side. The area is a big, big wetland. The region was an important staging point on the early wagon routes to Delagoa Bay and it was from here that the first tsetse fly free route to the coast was mapped and surveyed. In the town of Chrissiesmeer today, Clarke's Shop, which was once owned by such notables as Simmer and Jack of Germiston mining fame, is now over a hundered years old. With the opening of the rail link between Delagoa Bay and Pretoria the growth of the area became limited to farming and forestry for which it is now well known. A new drive to promote tourism will restore the area to a rightful position of importance. The people of the grasslands will ensure that your stay is a memorable one and that you will return to this beautiful corner of Mpumalanga. The Chrissiesmeer region is also called Matotoland, which is derived from maxoxo, the Swazi word for frog. 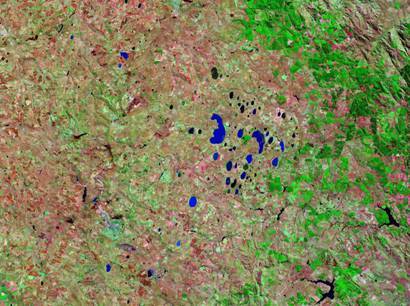 Thirteen frog species have been recorded in the area. These include the tiny Boettger’s caco (Cacosternum boettgeri) and the rattling frog (Semnodactylus wealii). Chrissiesmeer is best known for its incredible birding. The Chrissie Pans supports 287 species of birds, with a particularly wide variety of waterfowl lured by the numerous lakes and pans. The Red Data threatened bird species include Southern Bald Ibis, Grey Crowned Crane, Wattled Crane, Blue Crane, Lesser Flamingo, Greater Flamingo, Secretarybird, Blue Korhaan, White-bellied Korhaan, Denham’s Bustard, Black-winged Pratincole, Maccoa Duck, Chestnut-banded Plover, African Marsh-Harrier and African Grass Owl. In the late summer thousands of lesser flamingoes stop over here, one year we counted 18 000 flamingo chicks on Blinkpan. When inundated with water, these wetlands also support large numbers of Great Crested Grebe, Yellow-billed Duck, Cape Shoveller, Southern Pochard, Egyptian Goose, Spur-winged Goose, Red-knobbed Coot, Little Stint, White-winged Tern and Pied Avocet. When the pans are wet, total numbers regularly exceed 20 000 birds. 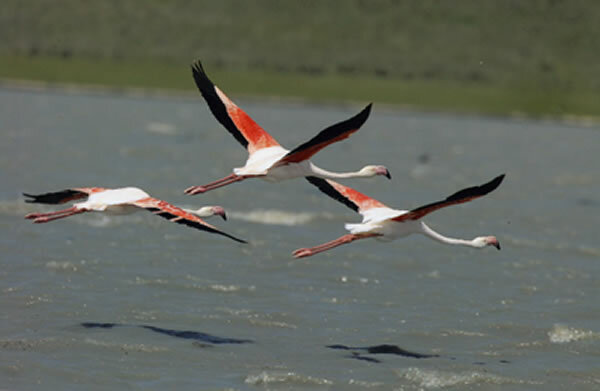 Similarly, when water levels permit, large numbers of Lesser Flamingo and Greater Flamingo can be seen. The first waders arrive in September, so the best time of year for wetland birding is between September and March. Cranes can be seen all year round. Both Blue Crane and Grey Crowned Crane breed in the Chrissiesmeer area.